Now available in paperback with bonus content and a new cover. 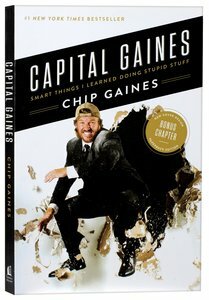 "National Bestseller-New York Times, USA Today, Publisher's Weekly, Wall Street Journal"
About "Capital Gaines: Smart Things I Learned Doing Stupid Stuff"
The funny and talented Chip Gaines is well known to millions of people as a TV star, renovation expert, bestselling author, husband to Joanna, and father of five from Waco, Texas. But long before the world took notice, Chip was a serial entrepreneur who was always ready for the next challenge, even if it didn't quite work out as planned. Whether it was buying a neighborhood laundromat or talking a bank into a loan for some equipment to start a lawn-mowing service, Chip always knew that the most important thing was to take that first step. Now a #1 New York Times bestselling book, Capital Gaines offers readers a ringside seat as Chip relives some of his craziest antics and the lessons learned along the way. His mentors taught him to never give up, and his family showed him what it meant to always have a positive attitude despite your circumstances. Throw in a natural daredevil personality and a willingness to do (or eat!) just about anything, and you have the life and daily activity of Chip Gaines. Capital Gaines is the perfect book for anyone looking to succeed not only in business but, more importantly, in life. Chip Gaines was born in 1974. He is a graduate of Baylor University. His early businesses included a lawn care company, selling fireworks, and flipping houses. He and his wife Joanna are the stars of the HGTV show, Fixer Upper and the co-authors, with Mark Dagostino, of the book, The Magnolia Story.